Energy Center includes several advanced standard features that go far beyond the basics of tracking and reporting of utility billing information, which it does very well. Energy Center can serve as your primary utility management platform and the centerpiece of a comprehensive organization-wide resource conservation program that encourages conservation on every level of your organization. Here is a brief summary of these special advanced features. Extra charges apply in selected cases. 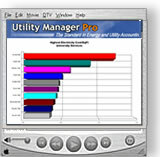 The Energy Center contains a dashboard on the home page as a standard feature. The dashboard gives "at a glance" views of utility consumption as well as special announcements, general system statistics and activity, quick links to frequent reports, and even Twitter feeds from social media. Users can modify this dashboard to determine what should be presented. In addition to allowing for unlimited users through a secure web connection, Energy Center also allows for defining different "User Types" which determine the specific features and reports different users may access. User Types may determine which sites or groups of sites users may access. For example, a building engineer may only be given access to the single building or group of buildings they are responsible for. Some user types may only be able to view reports and may not add or edit information. Energy Center uses a "live" connection to your Energy Star Portfolio Manager account for data uploads and downloads and takes full advantage of all current Portfolio Manager features including uploading of both energy and water data. Energy Center also contains special Energy Star reports and graphs based on data imported from your Portfolio Manager account. For example, graphs are available showing how your Energy Star ratings may have changed over time, or comparison graphs showing Energy Star ratings for all of your buildings. Energy Center uses advanced multi-variable regression for reporting the most accurate avoided cost results from your utility management efforts. Using both average daily temperatures and another variable of your choice (e.g., hours of operation, school days, etc. ), Energy Center automatically calculates the most optimal combination of variables and temperature balance points for your facility using a base period of your choosing. Energy Center allows for easy graphing of 15-minute electric load data from your utility smart meters or your own data logging devices. This interval load data (IDR) can be loaded for past years and then updated daily. Temperature and humidity data can also be overlaid on the graphs which can be displayed for any time period or data interval and compared to the same periods in the previous year. Multiple meters from the same or different buildings can also be aggregated when displayed. Energy Center has a number of unique features that allow for recording Walk-Through Audit information, tracking the implementation of Efficiency Measures, developing Facility Action Plans, tracking specific Projects and Contracts, and setting up individual building conservation Checklists. Keep all of your conservation planning and implementation information in one place! Energy Center allows you to track specific operation schedules for your buildings and includes a full events calendar for noting specific events (e.g., an early dismissal day for a school) that can affect energy use. The events calendar is accessible both on the Dashboard and from the IDR data area. With Energy Center you can upload key documents and photos related to your conservation program, including tracking useful links (URLs) to other sites, tracking relevant Twitter and RSS news feeds, and maintaining an Energy Blog. Social media feeds can be accessible on the Dashboard for quick access. The Energy Center ™ is a Registered Trademark of New Energy Technology.